This book discusses violence and its connection with religion, sport and popular culture. It highlights the religious dimensions of violence and the role of violence in the religion and culture of the American South. 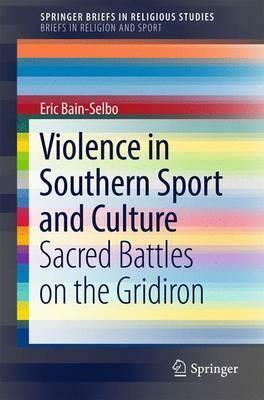 Extending into popular culture, it then makes the case that sport-particularly American football-is a cultural phenomenon in the South with close ties with religion and violence, and that American football has come to play a central role in the civil religion of the South, fueled in part by its violent nature. The book concludes by drawing important lessons from this case study-lessons that help us to see both religion and sport in a new light. Illustrations note IX, 53 p.
Pregame.- Kick Off.- Chapter 1. Theoretical Approaches to Religious Violence.- Chapter 2. Violence and American Football.- Chapter 3. College Football in the American South.- Chapter 4. Conclusions.- Appendices. Eric Bain-Selbo is the Department Head - Philosophy and Religion at Western Kentucky University and Executive Director of the Society for Values in Higher Education. His research spans the disciplines of philosophy and religious studies, focusing primarily on social ethics, political philosophy, comparative religion, cultural criticism, and issues in higher education. He has authored numerous articles and four books, including Game Day and God: Football, Faith, and Politics in the American South (2009) and Understanding Sport as a Religious Phenomenon: An Introduction (co-authored with D. Gregory Sapp, 2016).